Many users like to customize their editor coloring and PowerShell Studio lets them do just that. 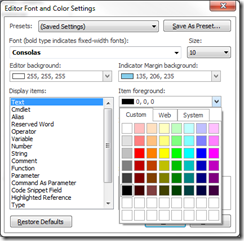 With PowerShell Studio, users can specify the coloring for the editor’s syntax coloring and backgrounds. 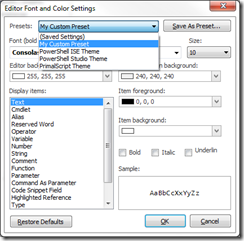 Using this dialog you can customize the font and coloring of PowerShell Studio’s editor. (Current Settings) Restores the settings to the last saved state. 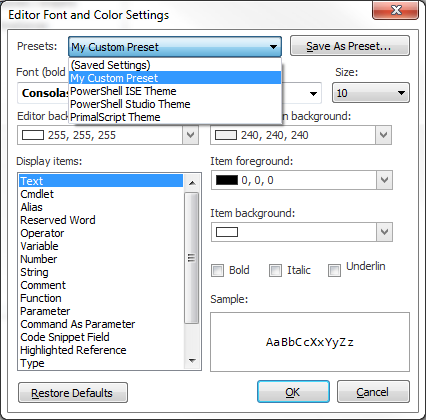 PowerShell ISE Changes the color scheme and font to match the default settings of the Microsoft PowerShell ISE. 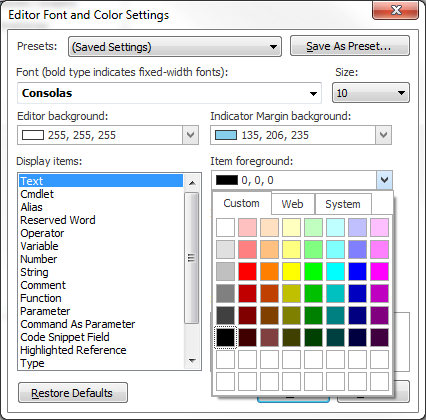 PowerShell Studio Changes the color scheme to the default PowerShell Studio coloring and font. 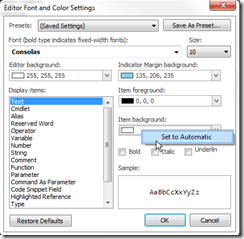 PrimalScript Changes the color scheme to the default PrimalScript coloring and font. 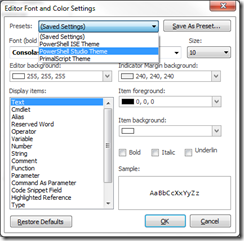 When you select a preset, the font and coloring settings are updated to the predefined preset. 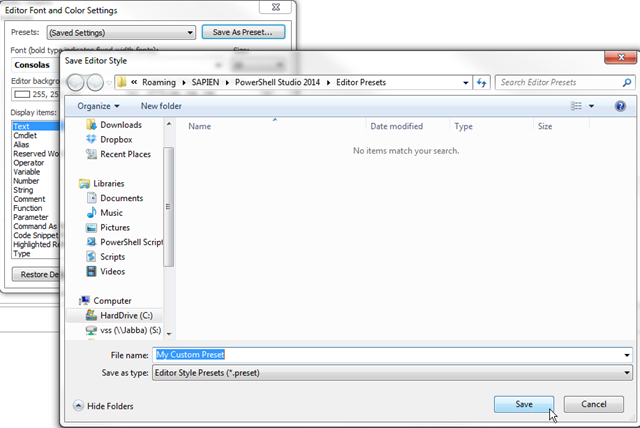 Simply click the Apply button and PowerShell Studio will use the new coloring scheme. 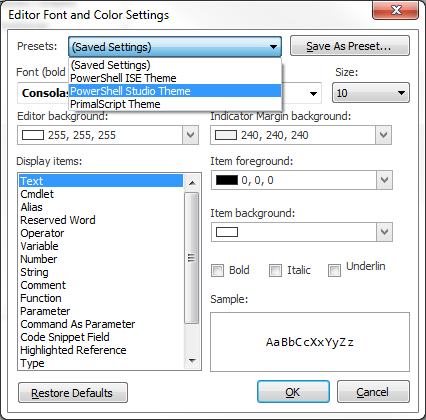 You can also create your own presets and share them with your colleagues if you wish. 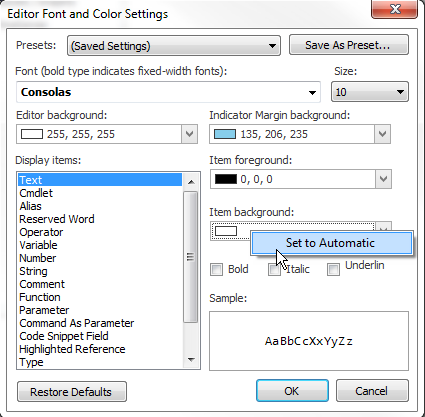 Simply configure the coloring setting and then press the Save As Preset… button. You will be presented with a Save As dialog. 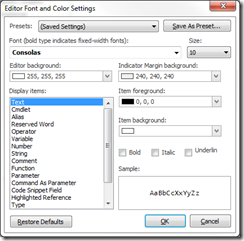 Next time you edit the font and colors, the preset will appear in the drop down list. 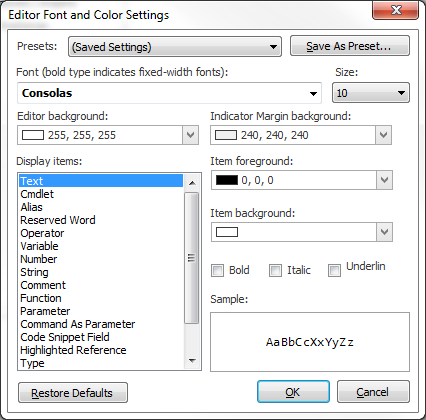 As before, you can change the font of the editor and its size. All bolded fonts are fixed point fonts. 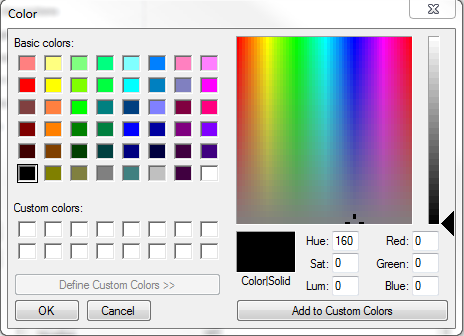 The color editor allows you to manually enter RGB values or use sliders to customize and select the desired color. 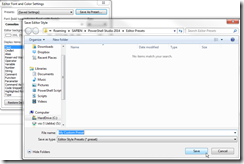 to bring up the context menu and select the Set to Automatic menu item. 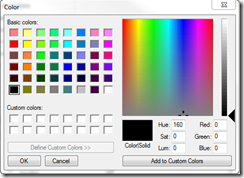 PowerShell Studio 2014 adds more options for color customization and allows you to tailor your workspace to your liking.